The workshop begins Tuesday, July 7 at 9:30 am. We will meet at Ladner Community Centre. 4734 – 51st St. in Ladner. Parents, please plan to stick around for the first 30 minutes or so. As usual we have a wide range of students from beginner level high school players through to very advanced semi-pro players. Students will be assigned ensembles to work with on the first day. Placement may change as we get to know your abilities, needs, and personalities. Our full-time faculty members will rotate among the groups on a daily basis. We expect a high level of courtesy and respect among all participants in the Workshop. We have never had any behaviour problems in the past and we hope to keep it that way again this year. Please bring everything you will need for making music: extra reeds, valve oil, patch cables, picks, strings, staff paper, pencils and eraser. Drummers, bass players, and guitarists are requested to bring their own amplifiers and drum kits. This equipment can be left at the workshop for the duration. If you don’t have an amplifier or drum kit please contact us immediately so we can help arrange to get one for you. We will have music stands available. Make sure all of your gear is labelled clearly so it doesn’t get lost. 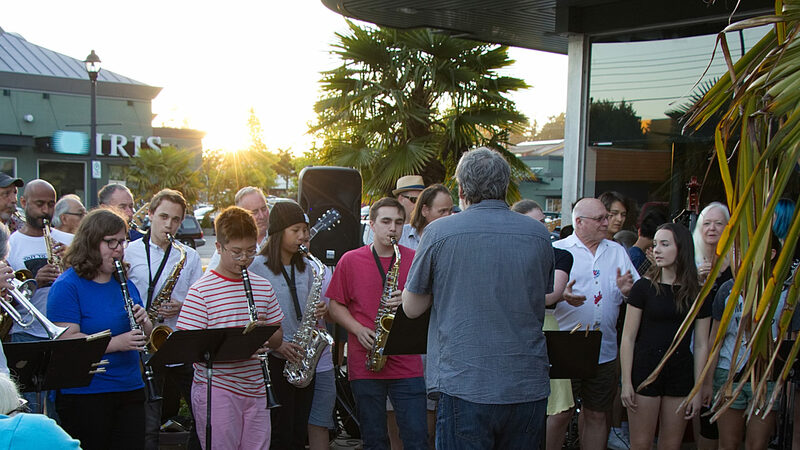 Thursday July 9 from 7-9pm is our workshop jam session. This is open to workshop participants and to anyone in the community who plays jazz. This is a really fun part of the workshop. If you don’t know what a jam session is or how it works, DON”T WORRY the workshop will prepare you for it! Saturday (July 11) schedule will be a little different as the student concert will take place from 12-3pm at the Delta Hospital Grounds. Our final performance will be part of the Delta Hospital Foundation Summer Gala. Parents, spouses, and friends are all welcome to this concert or any of the noon hour shows. Admission to noon shows and final student concert is free. Rehearsals on Saturday will run at the Community Centre as usual from 9:30-11 and then we will be heading over to the hospital grounds for our final performance. We will need help transporting students between the Community Centre and Delta Hospital, so if you can help us drive on that day please let us know. Please note that there are evening concerts on July 10 and 11.